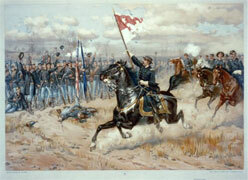 Sheridan’s Ride by Thure de Thulstrup depicts Gen. Philip Sheridan and his Morgan, Rienzi, a.k.a. Winchester. Image source: Library of Congress. Memorial Day is frequently considered the unofficial start of the summer season and a welcomed long weekend for beaches and barbeques. The holiday has a much more somber meaning, of course, as a time to remember fallen soldiers. Originally called Decoration Day, the holiday was celebrated by freed slaves during and after the Civil War in honor of Union soldiers. Over time, the observance evolved in the North and South to serve as a memorial for all soldiers who lost their lives in Civil War battles. Memorial Day is now a time to remember fallen soldiers in all American conflicts. Tracing the day back to its origins reveals that while the Civil War was devastating to both sides in terms of human casualties, soldiers weren’t the only ones who risked their lives. Equines played a number of key roles in warfare. Horses and mules were used to pull heavy artillery and pack military equipment. Good, reliable horses were essential to generals and cavalry men depended upon their mounts in battle. At the end of the conflict, recognizing the importance of good horses, southern soldiers were permitted to take their war horses back home with them. Traveller, the favorite mount of Commander Gen. Robert E. Lee. The gray gelding was of American Saddlebred breeding. He did not die on the battlefield, and in fact, outlived his rider, ultimately being put down due to tetanus. Lexington was a famous racehorse-turned-warhorse, ridden in battle by Gen. William Tecumseh Sherman of the Union Army. Lexington had a successful post-war career at stud, and was named the leading sire in North America 16 times. Cincinnatus, a son of Lexington, was the mount of Gen. Ulysses S. Grant. The Thoroughbred was said to be 17 hands and is best known for being Gen. Grant’s mount when he met with Gen. Lee to negotiate the Confederacy’s surrender. Cincinnatus also survived the war and died on a farm in Maryland in 1878. Old Sorrel, also known as Little Sorrel was the mount of Gen. Stonewall Jackson. Gen. Jackson was mounted on Old Sorrel when he was mortally wounded, but the Morgan horse lived for many years after the war, reaching the ripe age of 36. Old Sorrel is now buried at the Virginia Military Institute where Gen. Jackson taught, and his hide is mounted and on display at the VMI Museum. Rienzi, later known as Winchester, was ridden by Union General Philip Sheridan. This Morgan horse was made famous by the poem and painting, “Sheridan’s Ride.” He is now on display at the Smithsonian Institution, tacked up in the same saddle and bridle used by Sheridan. A horse known simply as “Old Whitey” was owned by eventual U.S. president, Rutherford B. Hayes. The courageous equine was said to have survived 19 battles in the Civil War with Major Russell Hastings of the Union Army. He was also the preferred mount of well-known battlefield nurse, Mother Bickerdyke. Sadly, many horses were considered expendable in war, as just another tool. And although it’s better to lose a horse in war than a human soldier, it is still tragic. I’m glad this article points out the equine contribution to the war effort. What great horses to learn about. I am sure there are many, many more that we will never know. So, if we’re honoring the fallen horses as well as fallen soldiers, why did most, or all, of the horses they listed survive the war?